Join us on our friendly and personal Dolphin Swimming with an intimate group of only 12 guests per tour. We are a small local family business, your Skipper and owner Steve is 5th generation from Akaroa. Department of Conservation Approved. 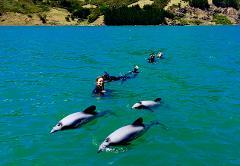 We will see and get close to all of the high scenic points and amazing wildlife Akaroa Harbour has to offer. Intimate group of only 12 guests per tour. Small local family owned business, your skipper Steve is 5th generation from Akaroa.